An easy raw food coconut soup recipe made from a young coconut and plenty of Thai spices, including ginger (or Thai galangal if you can find it), lime juice, curry powder, cilantro and chili. Fill it up with as many or as little veggies as you like. Perhaps some shredded greens or baby corn. 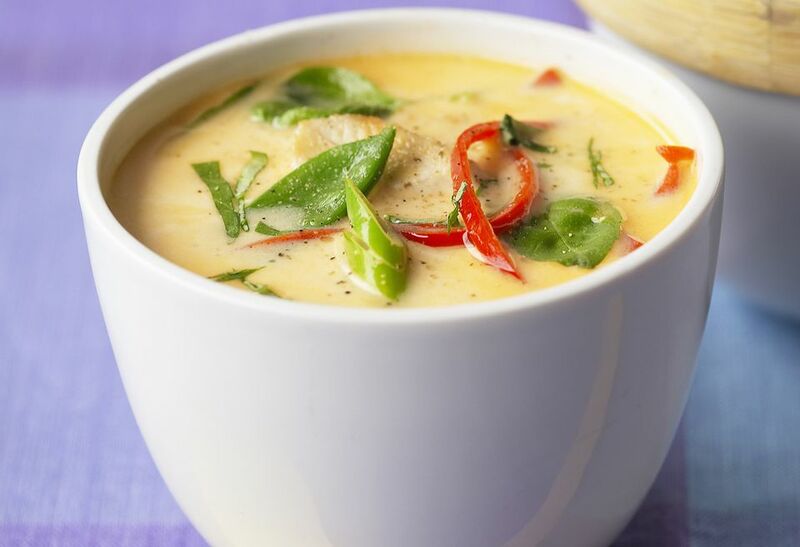 And of course, you can make this raw Thai coconut soup as spicy as you like by piling on the chili peppers! This is a raw vegan food recipe which is also vegetarian, vegan and gluten-free. Open the coconut and drain the water into a blender. Scrape out the meat, and add to the blender. Add garlic, ginger or galangal, lime juice, oil, curry powder, tomato, salt and chili. Blend until smooth and creamy. Adjust seasonings to taste. Add cilantro and pulse until cilantro is finely minced. Pour into serving containers and add any chopped veggies you like: bell pepper, tomatoes and thinly sliced mushrooms work well. This raw coconut soup works well after it's had a chance to chill in the fridge for a couple hours to allow the flavors to set. It'll need a good stirring before serving, however, as the oils and coconut water will tend to separate. Enjoy your raw food Thai coconut soup! Yum!